What Is The Best Stroller For Big Kid? In this article I present you the list of the most reliable, tested and best strollers for big kids from all brands and top-rated by all parents. Does your kid grow faster than its peers and has already outgrown your current stroller? Or maybe your child is 4 or 5 years old but sometimes still wants to ride in a stroller? Perhaps the school is far from your home and your kid is not able to go on foot the whole distance and you could use a stroller sometimes? Maybe your child is recovering from a surgery or has a medical condition and a stroller for big kid would be useful for you? No matter what is your reason, I’m here to help you choose the right stroller. Below I present you reviews of 15 big kids strollers and 2 wagons (stroller alternative) with wide variety of features and high weight limit. I hope you’ll find here something that will meet your needs! Many of modern strollers have higher weight limit and longer seat, therefore they can accommodate bigger and taller kids, up to 50 lbs or even 75 lbs! Umbrella strollers are getting more popular nowadays. They are perfect for travels or day trips, mostly because they are super lightweight and easy to carry (which is extremely important when you’re handling a big kid). They feature compact fold thanks to which many of them fit into carry-on luggage compartment on airplanes. However, small weight doesn’t mean that they are crappy or less functional. You might also think that umbrella strollers are only suitable for small and light children. Not at all! There are few great models of umbrella strollers for big kids, that provide comfortable and safe ride which is still crucial even for older children. Here are my favorite strollers for big kid, starting with umbrella type. GB Pockit Plus is a great lightweight stroller for big kid and thanks to wider seat (when compared to older model), taller and older children may feel more comfortable in it. GB Pockit Plus has many upgrades that parents were waiting for, but it remained small and portable. While the stroller is 3.5 lbs heavier than the previous version, it is still super light and easy to carry (only 13 lbs). Fold size has changed only a little bit (about one inch in each dimensions), so it still takes up a little space and is very easy to store. Stash it under the table in restaurant, put behind the seat in small car – it’s all seamless. Having such a compact stroller is really awesome, because when your 4 or 5-year-old is rested and ready to walk again, you can throw folded GB Pockit Plus into your handbag. What I like about this new model is the canopy which was completely redesigned. Now it’s bigger and rounded and actually does the job – it shades the baby from the sun. It’s still not very long, therefore it works best in most upright position. Another useful feature that manufacturer has added to the new GB Pockit Plus is the reclining backrest. Toddler and preschooler get tired as well and sometimes they like to lie back and rest or even take a nap. Therefore it is very handy to have a reclining seat, especially on longer walks or day trips to Disneyland etc. Small wheels and tiny storage basket are still there – these feature haven’t been changed. GB Pockit Plus is most suitable for smooth surfaces and you can even push it with one hand on flat pavement or indoor surfaces (like at the mall or airport). Besides, it’s so tiny, it will easily fit and steer through narrow store aisles and crowded airport or museum. GB Pockit Plus is quickly getting more and more popular, however there are different opinions about it – some parents love it, some say it’s worse than the original version. If you’d like to check the customer reviews at Amazon on your own, just click here. Below you can see the features that people like and dislike the most. Similar to the previous version (which has the same wheels and lacks the suspension as well) GB Pockit Plus is not suitable for bumpy terrain. 1. Thanks to roomy seat this is a stroller for older & tall kid. 2. It features super tiny fold which fits in mom’s handbag, under the table in the coffee shop. 3. It’s perfect for travels or trips to theme parks with older kids, who walk on their own most of the time, but sometimes like to jump on a stroller and rest a little bit. When the stroller is not in use you can carry it with no problem. This stroller can accommodate child up to 55 lbs. It weighs only 9.5 lbs which makes it the most lightweight stroller for big kids. Moreover, it features tiniest fold in the World! It folds into a small package which can easily fit into hand luggage compartment on airplane or it can be carried in a bag. GB Pockit is perfect travel stroller for older children. It is design for urban parents who are on the run with their kid. It’s small and light, but very sturdy and made of durable materials, so it can serve parents for couple of years. When my daughter was 3 year old (33lbs and 38in) she still had plenty of room in this stroller. I read many review of GB Pockit and many parents us it for 4 or 5-year-old children. For me it’s the best stroller for older child. This big kid stroller has also a basket under the seat which can hold up to 11 lbs of our essentials. It’s rather tiny but I didn’t expect more from such a light and compact stroller. There are also pivoting and lockable front wheels – swivel wheels increase maneuverability and locked wheels make the stroller more stable which is essential when we are going over uneven terrain. GB Pockit is also convenient to push and navigate through tight places like shopping aisles, restaurants and crowded sidewalks. Before I purchase a stroller, I always check what other parents say about it. At the time I’m writing this GB Pockit has few hundreds reviews at Amazon. Here are the main things that parents praise and complain about. Small wheels work fine on flat terrain, but they can get stuck on harsher surface. Moreover, GB Pockit doesn’t have recline seat, only the newest version – GB Pockit+ features multi-position seat recline and also infant car seat compatibility which according to many parents is worth those few extra dollars (see the latest price for GB Pockit+). 1. You can throw it in your bag, trunk, closet or bottom of the shopping cart any it won’t take up much space. Real space saver. 2. It is the best lightweight stroller for 5-year-old. It can easily accommodate older child without compromising his comfort. 3. With such a light and compact fold this is perfect travel stroller for big kid. It’s nice to have such a lightweight stroller when you’re handling older and heavier child! This is more expensive lightweight stroller but I decided to include it in my ranking, because it’s made of top-quality of materials and can easily hold 3 and 4-year-old child. The seat is 13 inches wide and deep and the backrest is 20 inches long which is pretty impressive. Additionally, there about 7 inches extra to the top of the canopy, so there’s plenty of head room. It means that a tall or older child fits there comfortably, but he may not be able to take a nap, because there’s no head support above those 20″. My 4-year-old daughter doesn’t mind it and still like to ride in G-LUXE when she gets tired in theme parks. 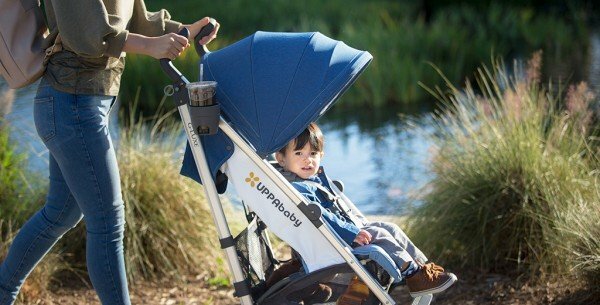 Lots of parents have been using previous version of UPPAbaby G-LUXE for kids older than 2. Even a big and tall 4-year-old can comfortably fit in it thanks to very roomy seat (read this review #1 or review #2 for example). The newest version of the stroller – G-LUXE 2018 is great for tall and big kids as well (max. 55 lbs), but additionally it has few upgraded features, therefore I recommend this version, instead of the older one. One of the new features is the single front wheel design which makes the stroller easier to push on slightly uneven terrain like gravel. Of course G-LUXE 2018 is still not suitable for bumps and unbeaten roads, but on flat terrain it pushes smoothly. The canopy material has been upgraded as well. It has 3 extendable panels and additional pop out sun visor which gives really great amount of shade for the little passenger. Another useful features like one-hand recline, all-wheel suspension and included cup hold make using this stroller really convenient. Folding takes little practice, but it’s something you’ll get used to. And since the stroller weighs only 16.3 lbs you’ll be able to carry it on a shoulder with included convenient strap. UPPAbaby G-LUXE 2018 is for sale since winter 2018 so it’s just getting more popular and there are not many reviews yet (you can check them here). Anyway, below I listed the major features that parents praise and complain about. 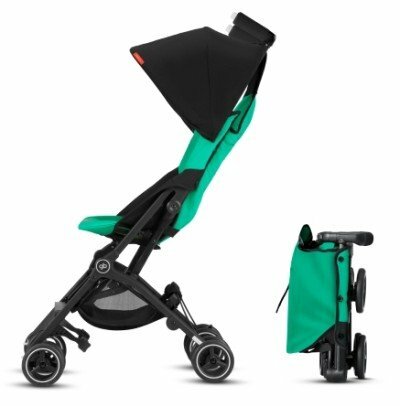 Older model of UPPAbaby G-LUXE has over 200 reviews, while the 2018 version is on the market since winter 2018 so it doesn’t have that many customer reviews yet, but I have no doubts it will be getting more and more popular. Below you can see the main advantages and disadvantages that customers mention for now. If you would like to check the customer reviews and latest price of the previous versions of UPPAbaby G-LUXE, which is also an awesome big kid stroller, click here. 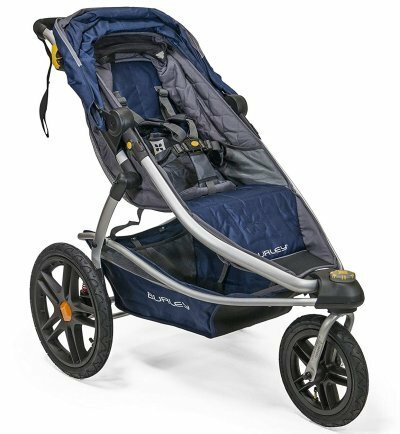 This is the most expensive model among lightweight strollers for big kids in this ranking. 1. Although it doesn’t fold up into small box, it doesn’t take up much space and thanks to self-stand it is suitable for small apartments. 2. Thanks to wide, deep and long seat this is a stroller for tall child. And with such a high weight limit, it can also serve as a stroller for bigger kids. 3. UPPAbaby brand is a guarantee of highest quality materials and fabrics. This is the cheapest lightweight stroller for big kid in my ranking. ZOE XL1 BEST v2 folds up and opens seamlessly, so whenever you’re in a restaurant, museum or train you won’t have any problems with closing it and storing. And thanks to compact fold, it takes up a little space and fits even in small car trunks. It is ultra-light (only 11 lbs) which makes carrying it effortless. It features nicely padded seat with deep recline (up to 165 degrees!) and HUGE canopy. Seriously, it will cover your baby’s knees! The seat is very roomy and there’s lots of head room for tall kids. Some parents use ZOE XL1 even for 4-year-old kids (for example read this review). The wheels are small, like on other lightweight strollers, and front wheel suspension. 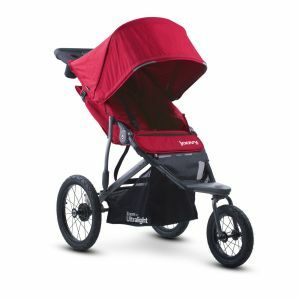 I wouldn’t recommend taking this stroller over uneven terrain because it will bounce, but it can handle pavement, sidewalks and indoor surfaces really great. Another great thing about this stroller is the amount of included accessories. It comes with Child Snack Cup and Child Cup Holder, Parent Cup Holder and Belly Bar! And all of that for less than $150. Find out more about ZOE XL1 BEST v2 in my review. I went through the customer reviews of ZOE XL1 at Amazon and here are the main features that parents are happy and not so happy with. Below you can find my short summary, but if you’d like to check the reviews on your own, click here to skip to Amazon. I wish the storage basket under the seat were made of stiff material, instead of mesh and I would prefer single action brake. But these are minor drawbacks and other than that, this lightweight stroller is awesome! 1. It’s an excellent choice for parents on a small budget. 2. It comes with a few accessories like cup holders for parent and baby, snack cup and a belly bar – it will let you to save money on accessories! 3. Good fit for 3 and 4-year-old kids, especially for travel and day trips outside the town or to theme parks. Lightweight and umbrella strollers are great because they are easy to lift and carry, but sometimes they don’t offer as many features as full-sized strollers do. I found few awesome (and light) standard strollers for older children with higher weight limit and longer seats. Here are my TOP 3 full-sized strollers for toddlers. It is a great city stroller for big kid with maximum capacity of 65 lbs! This is very high limit as for a standard stroller. City Mini GT is also a very comfortable stroller for tall child. Actually it has one of the longest seat back I’ve found on the market! Even kids over 40’’ fit comfortably in this stroller. Moreover, the seat is nicely padded with plush fabric. Besides, we can adjust the seat belts height, recline the seat and adjust the canopy to provide more comfy ride for our passenger. There is also a convenient foot rest. 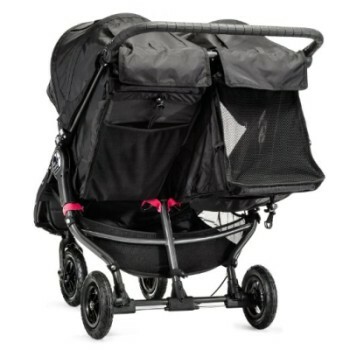 Parents praise this big kid stroller for a large extendable canopy with UV 50+ protection. 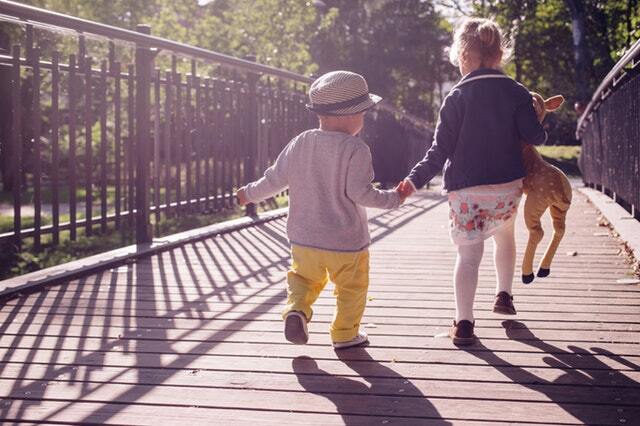 Thanks to it your toddler can enjoy strolls on sunny days. There is also a peek-a-boo window so you can keep an eye on your passenger. This is an everyday stroller, great for running errands in the city, shopping with a baby and using public transportation. Moreover, it has awesome all-terrain wheels and thanks to them you can take this big kid stroller on dirt roads or over grass with no trouble. In my opinion this is the best full-sized single stroller for bigger kids. Baby Jogger City Mini GT has adjustable handlebar which is essential for me, because my hubby is 1 foot taller than me. We can both push it easily. What I also like is the hand-operated brake which gives us maximum control over speed and allows to slow down or stop immediately at any time. Folding City Mini GT is a piece of cake thanks to patented folding mechanism. You just lift a strap and the stroller folds itself! Then it locks automatically so the stroller stays in that position during storage or transportation. Besides, we can carry the stroller thanks to the strap in the middle of the seat. The stroller itself weighs only 22.5 lbs so it’s pretty light to lift. And once it’s folded it takes less space than many lightweight strollers! Last time I checked at Amazon it had over 150 reviews, and majority of them are positive! It’s really popular stroller for big kid. Here are the features than parents praise and complain about the most. I must tell you, it has A LOT of advantages! The most upright position is still leaning back, so the very observant kid can’t sit straight. Another thing is that all accessories need to be purchased separately. 1. 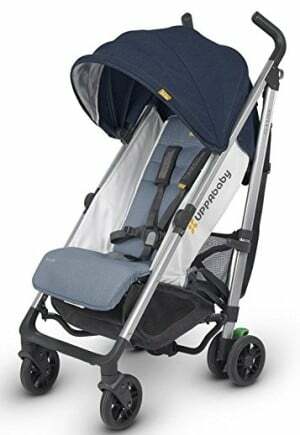 This is one of the big strollers, with roomy seat and tall canopy. Therefore it is an awesome stroller for tall kid or older toddler who still rides in a stroller or for a child with medical conditions. 2. Thanks to all-terrain wheels, slim design and light compact fold, this stroller makes getting around with a toddler super easy. 3. Easy to push for all-height parents, even with a 4-year-old child in the seat. I love B-Agile because it weighs only 18 lbs, which is just a little more than umbrella strollers weigh! It’s recommended capacity is 55 lbs therefore this is a stroller for big toddler. It has light aluminum frame so it’s very easy to lift and carry. The 3-wheel configuration with dual and swivel front wheel is great for going over city sidewalks and gravel paths. 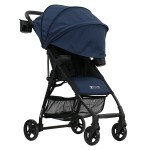 The stroller is very maneuverable and features really tight turning radius. All-wheel suspension gives you smooth and bumpless ride. What I also like is the brake – it’s not only easy to use but also when it’s engaged, the stroller stands still and doesn’t wobble. Large canopy with mesh peek-a-boo window provides great ventilation and excellent protection from sun rays. The seat has multi-position recline so you will definitely find the best position for your big toddler. B-Agile 2017 is awesome, multi-tasking city stroller for big kid. No wonder it’s Britax bestseller! Britax 2017 B-Agile offers large mesh basket underneath the seat which can hold your essentials, baby gear, shopping bags and many more. Folding is also very easy, you can quickly close the stroller using just one hand. It’s important for me to check what other customers say about the product I’m buying or reviewing. At the time I’m writing this, Britax B-Agile has over 100 reviews and most of them are 4- and 5-star (see for yourself)! This stroller is a best seller in the US. What parents consider as major advantages and disadvantages? Some parents think that adjusting the recline could be better. It’s easy to do, but you need to make sure each side is pulled evenly, otherwise the seat back will be lopsided. 1. This stroller is very nimble and turns on a dime, which is important when you’re pushing big, heavy kid. 2. If you are looking for the best stroller for 3-year-old child, B-Agile may be excellent option for you, as it can comfortably accommodate 40 inches tall kid. 3. This is one of the cheapest strollers for big toddlers and there are often great discounts on it! Do you need a double stroller for big toddlers? Maybe your twins are taller than their peers and you need a stroller with longer seats? I found on the market few double strollers for bigger kids with high weight limit and seats that can accommodate taller children. Here you will find a stroller that hold up to 100 lbs (or even more!). Check out my list of the best double strollers for big kids. This one is a great multi-tasking and all-terrain double stroller with weight limit of 50 lbs per seat. The stroller itself weighs 32.6 lbs which is pretty much, but remember it is a double pushchair. Seat height is 21” which is pretty tall compared with other strollers. I’ve read in other parents’ reviews that even 4 and 5-year-old children fit into this stroller! It’s definitely a big kid stroller. 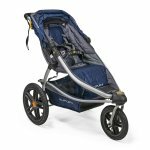 Baby Jogger 2016 City Mini GT Double has all-terrain rubber wheels which work great on city sidewalks and dirt roads. Other features that City Mini GT Double offers: adjustable handlebar which provide comfortable pushing for tall and short parents, compatibility with infant car seats, hand-operated brake, individually reclining seats and two large, independently adjustable canopies, each with two peek-a-boo windows. Oh, one more thing. This stroller has patented folding technology and actually folds itself! It made my life so much easier, when I was recovering from a C-section. Last time I checked City Mini GT Double at Amazon it has over 100 parents’ reviews, including over 80 positive ones. Really nice result. Here are the functions other parents mention most often. This stroller, despite its name, is not for jogging with kids. If you are looking for a jogging stroller for big kids just keep scrolling. 1. 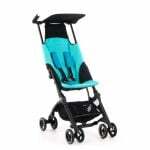 This is one of the big stroller that can be used for twins or two toddler at different age. With its great weight distribution and balance you will avoid pulling to one side or tipping over. 2. It’s super easy to push and navigate, so you won’t even notice how much weight you’re handling, even with two toddlers in it! 3. This is the stroller that hold up to 100 lbs and have high seat backs so it can accommodate very tall and heavy 3-year-old kid or an average 5-year-old child. You can also read my full review of this big kid stroller or you can check the current price for Baby Jogger City Mini GT Double >> HERE <<. This is one of the best strollers for older children. It can accommodate two toddlers, each up to 55 lbs! It’s really hard to find a stroller witch such a huge weight limit (110 lbs of combined carrying capacity!). Stroller’s basic weight is only 21.2 lbs which is really nice as for a double stroller. 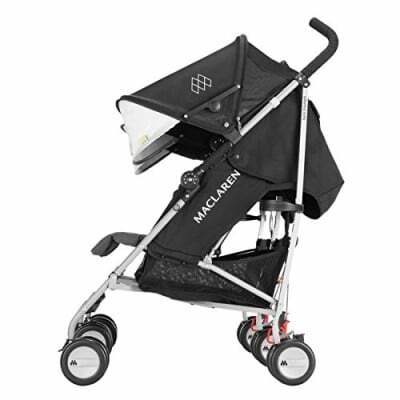 Maclaren Twin Triumph might be actually the only stroller you will ever need, because you can use it from birth (with Carrycot) until you child goes to school! Even 4-year-old and 40 inches tall children can comfortably fit in this stroller and rest their feet on the footrest without being squeezed. This is one of the best strollers for tall kids for sure! 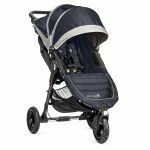 This stroller features also adjustable waterproof canopies with peek-a-boo window and UPF 50+, four-position recline seats and extendable leg rest. Twin Techno has six dual wheels which work excellent on flat terrain. There is also large mesh basket under the seats which can hold babies’ gear, your bag and few shopping bags! If you want a stroller for big toddlers or a stroller for big kid and baby you should go for Maclaren Twin Techno, because you can use it two different seats. It’s great everyday city stroller, not only for strolls in parks but also running errands and shopping with kids. I checked other parents reviews at Amazon and here are the features that they love and complain about. This stroller works smoothly on flat terrain, but worse on bumpy, rough surface. 1. The seat is big enough for an average 4-year-old kid. With such a huge weighs limit this stroller can be also used for toddlers heavier than their peers. 2. 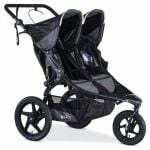 As for a double stroller Maclaren Twin Triumph is light and easy to maneuver which is very useful when you go out with two older and heavier children. 3. It can be used as a travel stroller for bigger kids or as an everyday city stroller. 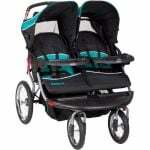 This is a great double lightweight stroller for big kids, perfect for travel or running errands in the city. It weighs only 17 lbs (WOW!) which is very little for double stroller. Maximum weight recommendation is 50 lbs per seat. Zoe features long seats with 23 inches from the bottom of the seat to the canopy. This big kid stroller can accommodate even a 3 or 4-year-old passengers! Here are few things I like about ZOE XL2 BEST: it has lightweight but durable aluminum frame, it folds easily and quickly. There are two child cup holders, one child tray, one parent cup holder and double padded belly bar included for free. 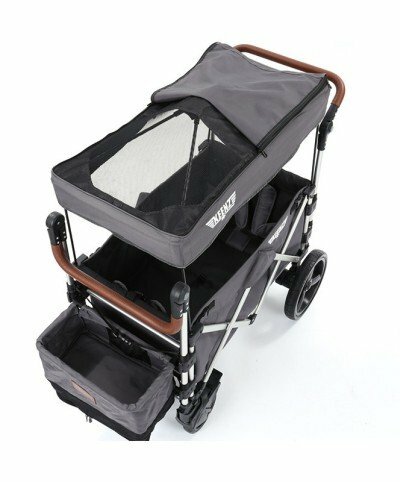 This stroller features also large, extendable sunshades with storage pockets on the back where you can keep your essentials like keys or phone. Canopies have also peek-a-boo windows with magnetic closure which is a big plus. Pushing ZOE XL2 BEST is like a breeze and the wheels roll nicely, but this is not an off-road stroller. It’s great choice for urban parents, who are often on the go with their toddlers. 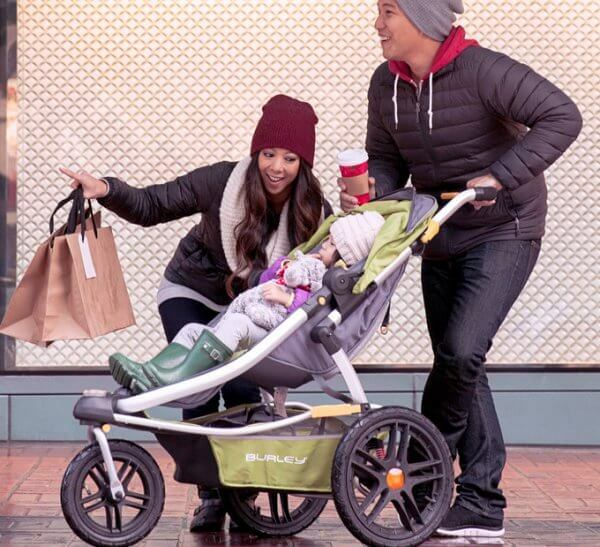 This stroller is incredibly popular – just see how many reviews it has (click)! What features parents like and dislike? This stroller is not made for off-road strolling, however it pushes smoothly on pavement. 1. This is probably the lightest double stroller for bigger kids. 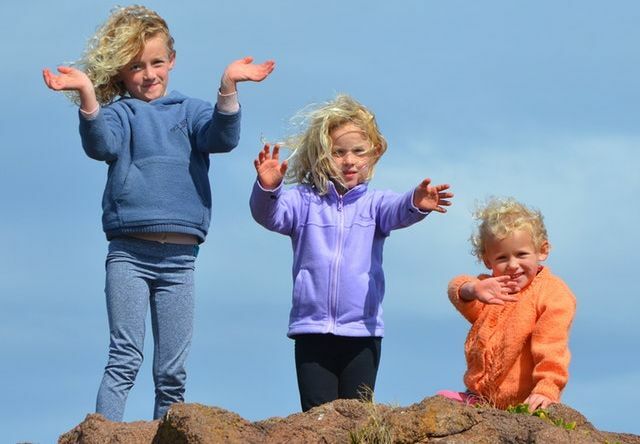 It’s super easy to push or lift, which is essential when you’re handling two older children. 2. It comes with many accessories (like cup holders and child tray) so you don’t have to spend extra money on these items. 3. 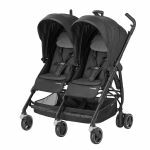 If you are looking for a double stroller for big kids that you could travel, go for a shopping or use public transport with, ZOE XL2 BEST is just for you. This is a double stroller for bigger toddlers thanks to maximum capacity of 50 lbs per seat. It is also a stroller for older children and it can be used up to 4 years. There is about 23’’ from the bottom of the seat to the top of the canopy so you can be sure your 4-year-old will fit there comfortably. Maxi-Cosi Dana For2 is also a great stroller for big kid and baby, because we can use it with one infant car seat and one toddler seat. What other features I like the most? There are large canopies that provide nice coverage from bright light. Canopies feature peek-a-boo windows so we can spy on our toddlers during strolling. The seats have multi-position recline so the toddlers can sit upright and watch the surroundings or lay back and take a nap. Dana For2 is convenient to maneuver and turn even in tight spaces. There is also good-sized basket for all your family’s gear and one parent cup holder. After folding Dana For2 is not the smallest stroller, but it’s easier to transport and store than many other double buggies. The stroller itself weighs around 35 lbs and is 31.5″ wide so it fits easily through regular doorways and elevators. I check this stroller at Amazon to find out if parents think it’s worth the money. Take a look at the features that parents often mention as pros and cons. This stroller has small wheels which work fine on flat terrain, but they don’t handle bumps really well. 1. With long seat and high weight limit it is a stroller for bigger kids. 2. No matter if you have two larger twins or close-in-age siblings, in Maxi-Cosi Dana For2 they will travel together in comfort. 3. Don’t worry if your kids grow faster than their peers – this stroller can hold up to 100 lbs! 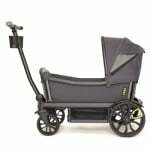 Check out the current price and available discounts on Maxi-Cosi Dana For2 >> here <<. You like jogging with your toddler but he/she grows faster than peers and is already too big for your current jogger? Don’t worry! I found few awesome jogging strollers for big kids with the highest weight recommendation on the market! Just choose one jogger from the ranking below and you’re ready to hit the trail with your toddler. The newest Zoom 360 Ultralight weighs only 25.7 which is really very little for a jogger. It’s one of the best strollers for older children, thanks to a maximum capacity of 75 lbs and long seat that can accommodate even a 44 inches tall child. Even at maximum load this stroller is still very sturdy and easy to maneuver or turn. Inside of the seat there are mesh pockets so the toddler can keep there some snacks and other take-alongs. This jogger has big wheels: 16″ in the back and 12″ in front with air-pumped tires. Moreover, the front wheel can be locked straight to increase stability during running or going over bumps. And when the front wheels swivels it gives maximum maneuverability and agility. Large canopy gives your child plenty of shade while you’re on the go. You can see your passenger through a peek-a-boo window. 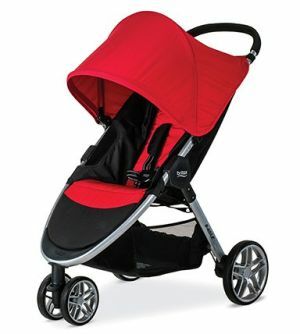 I like the canopy and the stroller fabrics because they provide great air-flow. Joovy Zoom 360 Ultralight also includes very practical parent organizer. You can keep your keys and phone in a zippered pocket and even two bottles of water in beverage holders. 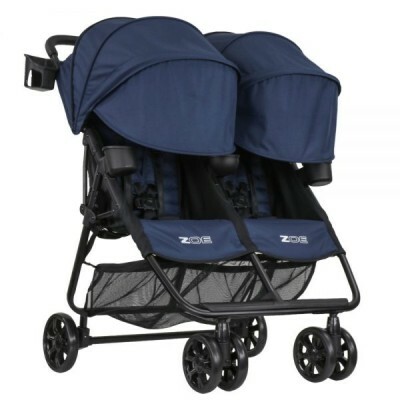 And last but not least, Zoom 360 Ultralight is one of the cheapest jogging strollers on the market today! So if you are looking for a jogging stroller for big kid, but your budget is limited, don’t hesitate anymore and go for Zoom 360. This jogger is very popular and has amazing rating at Amazon. At the time I’m writing this, there are over 200 reviews!. What parents praise this stroller for and what are the major complaints? As probably every other jogging stroller, this one is also pretty bulky and takes a lot of space. However, you can easily take off the wheels to simplify the storage and transport. 1. This jogging stroller for big kids won’t cost you an arm and a leg! In fact, it’s one of the cheapest, yet high-quality and well equipped joggers. 2. It has enormous capacity and roomy seat – it can accommodate even a 7-year-old child! 3. 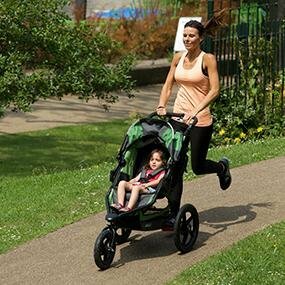 It’s super lightweight, but sturdy which is essential when you’re running or strolling with a heavy kid. 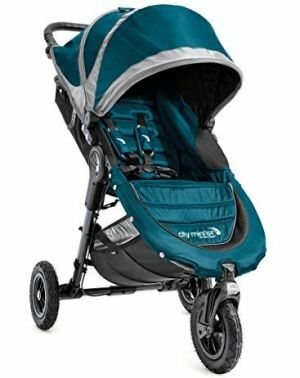 This is one of the most popular jogging strollers for bigger toddlers. No wonder – it can hold a child up to 75 lbs/44 inches and has a very roomy seat! The backrest is tall and there are few extra inches to the top of the canopy, ensuring long usability. This stroller is good choice for older kids and heavy toddlers. Based on the opinions of other parents I can say that this stroller can be used even for 4 or 5-year-old children (for example check this customer reviews: #1 & #2). This is truly big kid stroller! There are two big 16″ wheels in the back and one smaller – 12.5″ in front. Swivel front wheel gives better maneuverability and it can be locked to increase stability on harsher terrain. There is also great working suspension system that absorbs all impact and provides very smooth ride. According to many parents the stroller is so agile and easy to operate that you don’t even feel that you’re pushing a heavy toddler in it! This big kid stroller has adjustable, telescoping handlebar that makes steering convenient for short and tall parents. It’s a rare feature among joggers – really nice addition from Burley! 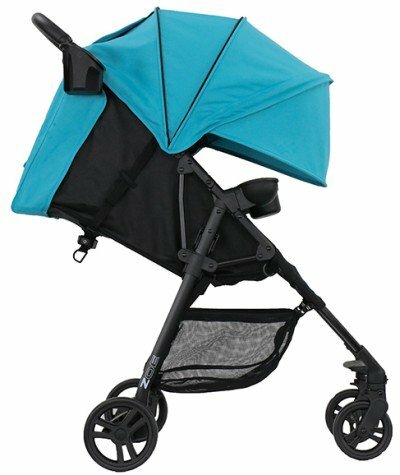 Other great feature of this stroller: it has multi-position canopy gives full coverage and great protection from sun rays. There is also peek-a-boo with magnetic closure. I know how much you love magnetic closure. The seat reclines only slightly, but for a quick nap for a 4-year-old kid it is sufficient. There is soft padding and specially designed harness that pops up out of the way when you press the release button. Thanks to it putting a frisky toddler in and out of the seat is much, much easier and the straps don’t get tangled. There is also large and easy-access storage basket under the seat which can accommodate all of your equipment for exploring outdoors. It’s important to keep in mind that this stroller is not the smallest or lightest out there – it weighs 29 lbs and the fold is quite big. On a positive note, it closes easily with one hand. 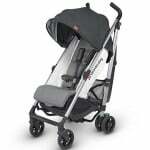 Burley Solstice is one of the highly-rated jogging strollers at Amazon. Last time I checked it vast majority of customer reviews was 4- and 5-stars!). In the table below you can see what features parents consider as assets and flaws. If you’d like to see the opinions for yourself – click here. There are no accessories included, so you need to purchase them separately. 1. Thanks to this stroller you can stay active or lose extra pounds, while your kid is having enjoyable, comfy ans safe ride. 2. This stroller can accommodate heavy and older children – large and high canopy provides lots of headroom. 3. If you want a high-quality jogging stroller for heavy child, that will handle harsh terrain, Burley Solstice will satisfy you! In my opinion, this is one of the best single jogging strollers for big kid. I started using it when my daughter was about 8 months old. It weighs 30.5 lbs and offers maximum capacity of 75 lbs. It has very solid and sturdy construction which makes this stroller perfect for transporting bigger toddlers. 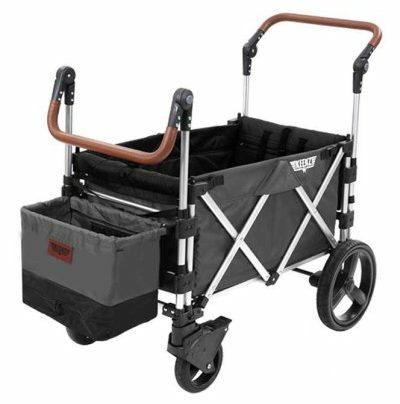 PRO has large wheels which works amazing on bumpy terrain like unbeaten paths, cracked sidewalks or sandy beaches. Rear wheels are 16″ and the front one is 12.5″. The front wheel can be set in two positions: swivel for better agility and locked forward for more stability during jogging on rough terrain. With BOB you can go over the most challenging terrain thanks to amazing suspension system that absorbs all shocks and bumps. There are two more features that I love about BOB Revolution PRO. It has adjustable handlebar with 9 different position. Therefore I can lower it down and my husband can set it higher for more comfortable pushing. 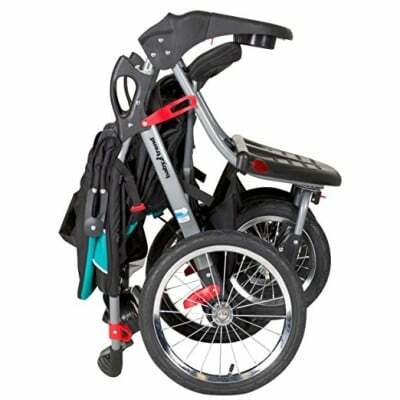 Moreover, this stroller is equipped with two brakes – typical foot-operated parking brake and additional handbrake which is essential for controlling the speed while jogging down the hill. 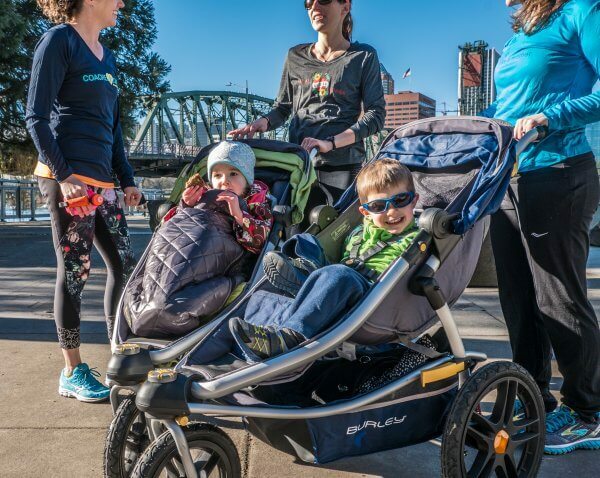 BOB Revolution PRO is not the tiniest stroller in the World, but it’s a jogger – large stroller for older child, made for the toughest terrain and it serve this purpose perfectly. Folding size is similar to other joggers’, we can also take off the wheels so the stroller would take less space. At the moment I’m writing this review, this jogger has over 100 reviews at Amazon and almost every one is positive! So what parent like the most in this stroller and what are the main flaws? This jogger is rather pricey, but there are often nice discounts which allow to save even $100. Check the current price and available discounts >> HERE <<. 1. It has the biggest capacity among single strollers so even if your toddler is heavy and big for his age, he will fit comfortably in it. 2. Thanks to awesome wheels and state-of-the-art suspension, your kid won’t feel any bumps, while you’re getting a good run or hike. 3. If you are looking for a real jogging stroller for big kids, that would glide over any kind of terrain, this stroller is made for you! 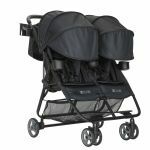 I decided to present you also two double jogger strollers for big kids – the best that you can find on the market today. Let me introduce you my favorite and absolute #1 double jogger – BOB Revolution PRO Duallie. It can accommodate two children, each up to 50 lbs. 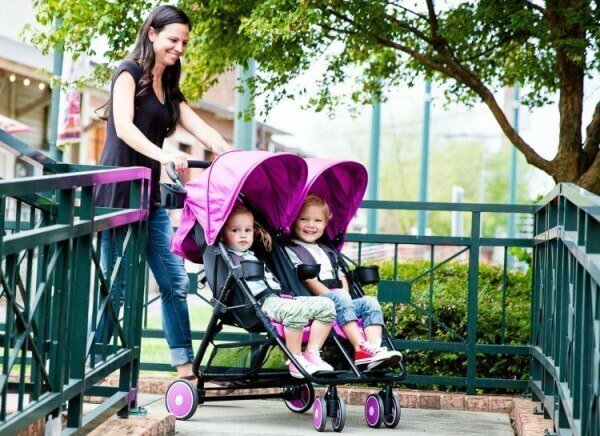 If you’re a fan of jogging and have two big kids, this stroller won’t let you down! I’ve been jogging with BOB Revolution PRO Duallie for a year already and I’ve taken it to the beach, snow, wooded paths and unbeaten roads in the countryside. It always glides like a breeze, no exceptions! Here are some features I like the most in this jogger. It has two brakes – one foot-operated and one hand-operated which gives you maximum control. Handbrake is very useful especially if you like to jog in a hilly area. Just like the single PRO, Duallie also has 16″ rear wheels and 12.5″ front wheel. BOB features air-filled tires which are great for bumpy terrain. Front wheel locks forward which is crucial when you are going over rough surface. And when it swivels it increases maneuverability which is useful during turning and going through tight spaces. Thanks to excellent suspension system your toddlers will enjoy smooth ride and won’t get bumped-around. Adjustable handlebar offers 9 height position which is great for all-height parents. To sum up, in my opinion BOB Revolution PRO Duallie is the best double jogging stroller for big kids. Read more in my full comprehensive review. Just like the single version, this stroller also has many positive reviews at Amazon (almost only positive!). The main advantages and disadvantages are presented in the table below. This is definitely one of the most expensive double joggers, but this is the price for ultra sturdy construction and amazingly cushioned ride for two big kids. 1. When we add the weight of the stroller to the weight of two big toddlers, it would make a real beast to control! Thanks to foot-brake and hand-brake you can always feel safe, no matter if you are going over flat or hilly terrain. 2. This stroller is strong enough so two kids can comfortably sit in it. It can be also used for kids at different age and weight, because the stroller has excellent weight distribution and doesn’t pull to one side. 3. It has awesome wheels and incredible suspension which allow you to go wherever the adventure is calling you! 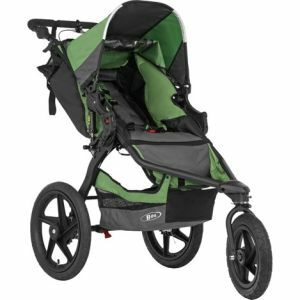 Feel free to check out also other great BOB jogging strollers for big toddlers: FLEX and Sport Utility. This stroller is a great option for those who have twin toddlers or two big children at similar age. Each sit can accommodate a child up to 50 lbs and 42″ so this is a real stroller for big toddlers. I’ve read many reviews and found out that some parent used it even for 5 and 6-year-old children (for example: customer review #1, #2, #3, #4)! As for a jogger it has pretty unusual 4-wheel construction. Front wheels can be locked straight for greater stability or they can swivel which makes the stroller more nimble. Navigator has pneumatic tires like a bicycle. Thanks to them we can jog over uneven terrain. 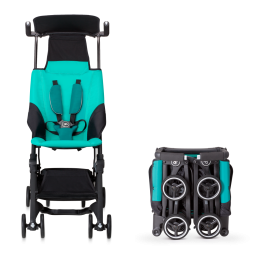 This stroller comes with a parent tray which is equipped with two cup holders, storage and MP3 speakers! That’s pretty fancy feature. 🙂 According to other parents they are loud enough so you could hear it during jogging without waking your neighborhood. It doesn’t fold as compact as umbrella strollers, but it FITS in majority of car trunks! At the back of the seats, just under the canopy there are two mesh windows which provide extra air-flow. This is very useful during jogging on summer days. Seats feature multi-position recline providing very comfortable ride for our toddlers. The canopies can be set in different directions, depending on where the sun is (they retract from the top so that you can pull it down). 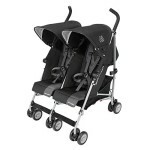 Baby Trend Navigator weighs 43 lbs which is quite a lot, but it offers quick and easy folding. 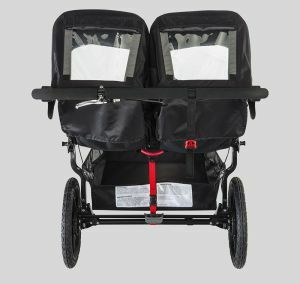 When the stroller is folded it has similar size to other double joggers. It will probably take up most of the space in your trunk. This stroller is beloved by many parents, not only because if its low price, but mostly because of its awesome features. It has over 150 positive reviews at Amazon. Here are the main assets and flaws that parents mention. 1. 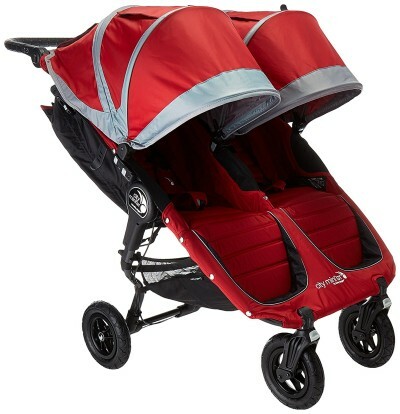 This is one of the most popular double jogging strollers – it is highly-rated by dozens of parents in online reviews! 2. This stroller can hold up to 100 lbs so it can accommodate even two 5-year-old kids or you can use it for toddlers at different age and size. 3. This double jogger has very pocket-friendly price. 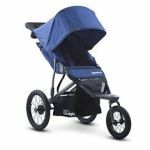 So if you want a solid jogging stroller for big kids, but you have to stick to your budget Baby Trend Navigator is a great solution for you. Wagon is a great stroller alternative for older kids. Usually it has two seats with a high weight limit and can be used for heavier and older children. Strolling in wagon is so much fun, when two kids can face each other! However parents should carefully choose it, because there are plenty of poor quality wagons-toys that are rather suitable for play than everyday use. Here I’m presenting you the best strollers wagon for bigger toddlers which provide safe and comfortable ride and can be used instead of a normal stroller. They meet safety standards and can be used as an everyday vehicle for kids. This wagon is a really smart investment – it can be used for infant, toddlers, preschoolers and even older kids! With this thing you won’t actually need a stroller as it will serve you for several years. The Veer Cruiser can be used with an infant car seat or the wagon can serve as a bassinet, so we can use it since birth. It’s also a great option for parents who have a baby and toddler, because older child can sit on the built-in seat and the infant car ride in a car seat attached to the frame. This stroller wagon combo can also accommodate two preschoolers or even older kids. Veer Cruiser can be used since day one till your kids go to school! For parents convenience there is an adjustable handlebar and foot-operated brake. The wagon can be pushed, pulled or pulled alongside. There is a front suspension and large all-terrain wheels with knobby tires. Rear wheels are equipped with fenders so muddy and dirt trails won’t be a problem with this wagon. With this stroller wagon hybrid you can take your kids for a cruise wherever you want! Veer Cruiser has also large storage basket where you can everything you may need during a day trip. The seat are equipped with 3-point harness, there is also can removable canopy (you can buy it separately or as a set with the wagon). Each seat can accommodate passenger up to 55 lbs which is a weight of an average 7 or 8-year-old child! This this perfect stroller alternative if you have one or two kids, especially if they are big for their age or you want vehicle that you could use even when they get older. It can be also very useful for an older child with special needs, and can be used for long period of time, since the general weight capacity is 110 lbs. Parents that already posted their reviews at Amazon are really pleased with this stroller wagon combo. Below are the major things that they mention. You can check the reviews on your own here. This wagon is pretty heavy (weighs 32.5 lbs) and expensive – but it will serve you for years. 1. It’s an investment for years, as it can be used not for one but for two children, from birth till your kids go to school. 2. It comes with two cup holder and a child tray, so you don’t have to spend extra money on these accessories. 3. It has really high weight limit and it’s very spacious so it can be used for a toddler that grows really fast, older kid or child with special needs, when no other stroller can accommodate them. 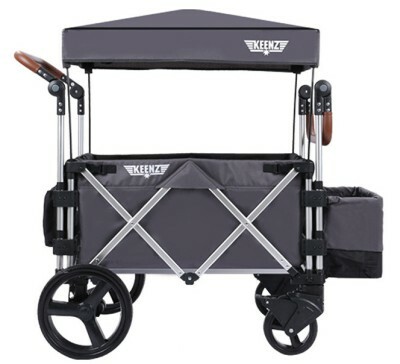 This big kid stroller wagon is much cheaper than Veer model, yet it has many awesome features. It combines advantages of the best strollers and wagons. Here are the main features. It has two adjustable handles (43″ is the highest setting) so it can be pulled or pushed, whatever suits you better. It weighs only 29 lbs, which is really small as for a wagon for two older kids! Wagon interior is softly padded and there are back cushions. Each seat has 5-point harness and the whole wagon can hold up to 110 lbs (passengers + items in storage basket). It has retractable roof with mesh sunscreen and a curtain to protect your kids from the sun, wind and rain and prevent from overheating at the same time. Front wheels are 7.28″, the rear ones are 11″. All have tread pattern and there is also spring suspension and built-in cushioning. Front wheels can be also locked for more rough terrain. There is also large removable storage bin with built-in shoe compartment. 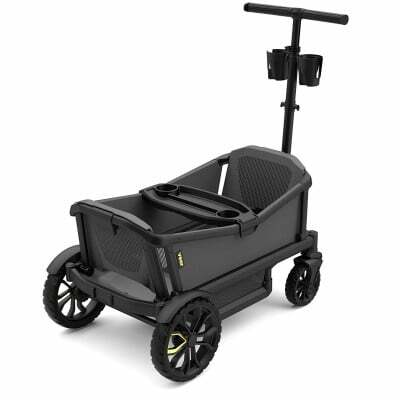 This wagon is great stroller alternative for two heavy toddlers or older children. Riding in it is awesome fun for the kids, so you can be sure they will want to use it really often! It can be also used for a child with some medial conditions, and sice the general capacity is 110 lbs it can be used for a longer period. I’ve read that parents use it even for 11-year-old child with special needs and it was a lifesaver, because there was no other stroller that could accommodate such a big boy (find out more in this customer review). This wagon is available on the market for a longer time and it’s really popular at Amazon. At the moment I’m writing this, it has dozens of positive reviews (check the current number of reviews here). Many parents mention that they never thought they would have a wagon, but after the first use they love it and it’s super useful for them! Here are the features that parents mention most often. Folded Keenz 7S Stroller Wagon still takes up much space (like a double stroller), but it fits in majority of car trunks. 1. 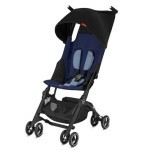 It can accommodate bigger and older children who can’t fit in any other stroller. 2. Perfect choice for parents and children who have active lifestyle. 3. Cruising with this wagon is excellent fun not only for kids, but also for parents. Most of standard strollers are design to accommodate a baby up to 30 or 40 lbs. That’s understandable if we consider that most of kids ride in a stroller till 2 or 3 years, when they weigh about 30 lbs. But every child develops at a different pace therefore sometimes a child can be bigger than its peers or want to ride in a stroller longer than other kids or there can be some medical reasons. Manufacturers respond to those needs and that’s really awesome! As you can see there are a few great strollers for big kids so I’m sure you will find something for you and your kiddo. There are different types of big kids strollers, they have different features, different weight limit and different size of the seat – as all babies and parents have different needs and preferences. Therefore, no matter if you are looking for a stroller for older children, bigger toddlers or a child with some medical condition, make sure the stroller you picked has the capacity you need and other features that will fulfill your family’s needs. Remember that it’s not safe to use a stroller for a baby that exceeds the weight limit, because the stroller is less stable then and it might easily tip over or broke. Not to mention that it’s not comfortable for a child when he/she is hitting the canopy with his/her head or his/her feet touch the ground during a stroll. Wow! Such great and comprehensive review! Going to Disney with a 3 year old and a 6 year old. Considering getting the wagon. Both kids are about 45lbs + each. I am concerned about the comfort of the wagon. Would the 3 year old be able to nap? It is comfy to sit on it? I never really used a wagon before but I could see how it could be a good investment. Generally speaking stroller wagons are awesome for two older sitting kids and very comfy for day trips. However, if you want both your kids inside, I don’t think there would be enough space for a 3-year-old to lay down and nap. But if your older kid could walk during the younger one’s nap, it should work fine 🙂 Just keep in mind that only Keenz wagon has flat floor (just add a blanket to make it more cushy for the nap time). If you have any suggestions I’d love to hear. I live in rural Canada so I can’t easily test strollers at the store. While I was writing this article, I considered dimensions (and checked hundreds of reviews) of over 80 strollers and chose only the ones that have really roomy seat, long backrest and lots of head room, and higher capacity. 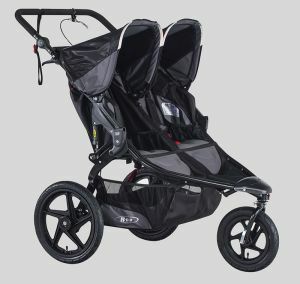 So if your child is already 43 inches tall and 39 lbs you can skip strollers like Baby Jogger City Tour, Babyzen Yoyo+, Mountain Buggy Nano, Cybex Twist or Chicco Mini Bravo… I found only 4 lightweight strollers that are suitable for children over 4 and 5 years old and you can see them in this ranking. Below you can find some of the dimensions, I hope it will be helpful for you. GB Pockit – Weight: 9.5 lbs, capacity: 55 lbs. The seat is 12″ wide and about 24″-25″ long. If you look at GB Pockit you will notice that its backrest goes from the bottom of the seat to the top of the canopy, there is no gap between the backrest edge and canopy (the top of the backrest is like a headrest). 24″-25″ it’s a length of a whole backrest. GB Pockit Plus – Weight: 13 lbs, capacity: 55 lbs. The seat is slightly wider. Similar to the original GB Pockit it can fit 5 or even 6-year-old kids. ZOE XL1 – Weight: 11 lbs, capacity: 50 lbs. The seat is 12.5″ wide, while the backrest is 18″, and there are 8 inches above it to the top of the canopy. For a tall child there is no headrest and their head is above the backrest, but since the canopy is really tall there is a lot of head room. 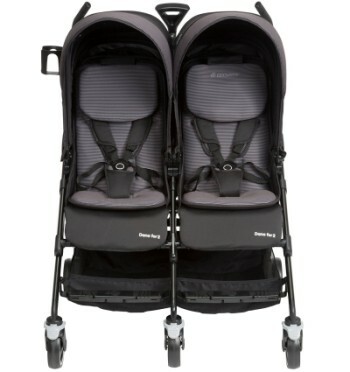 UPPAbaby G-LUXE – Weight: 16.3 lbs, capacity: 55 lbs. The seat is 13″ wide, backrest is 20″ long + 6/7 inches to the top of the canopy. However, this stroller folds like an umbrella (narrow, but long), while the three previous strollers fold into a compact box. You did an amazing job on this article! Palsy causing their legs not bend at the knee easily. Neither can walk and trying to push two wheelchairs is a joke. I would also love to go running but the jogger I have no longer contains their non-bending legs and someone’s foot always gets dangerously close to the wheel. I can’t take them shopping. They don’t bend into a grocery cart seats and can’t bend to fit together in the back (except Costco). knew someone that could fabricate perfect strollers for me. I can picture it in my mind but don’t know how to go about it. Thank you for all your work on this article and for being aware of special needs moms too!!! I wish that you could find a stroller that fits your family needs… I tried to look for a double stroller with higher capacity and adjustable leg rest (that you could flip up to a flat position), but it seems that it doesn’t exist! 🙁 There are no jogging strollers with adjustable leg rest either. Have you thought about a stroller wagon? You would probably have to use it for one child at a time, but for example Keenz 7S wagon has a flat bottom (where the child sits) so it would be more comfortable for your children. 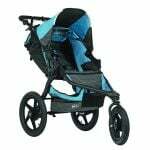 It’s not suitable for jogging, but has really good wheels that handle rugged terrain and soon there will be new beach wheels available so it’s a really good option for staying active… Only I’m not sure if it’s possible for you to take only one child for a stroll at a time. I’ve heard about Joovy Qool, but I haven’t tested it. I’ve tried other expandable strollers like Vista, Evenflo Xpand, Baby Jogger City Select. Which one would you best recomend? Thanks. Both strollers are great for a tall and older child, lots of parents use them for 5 year old kids (or even older) with special needs. ZOE XL1 Best v2 has more features for child’s comfort than Pockit. 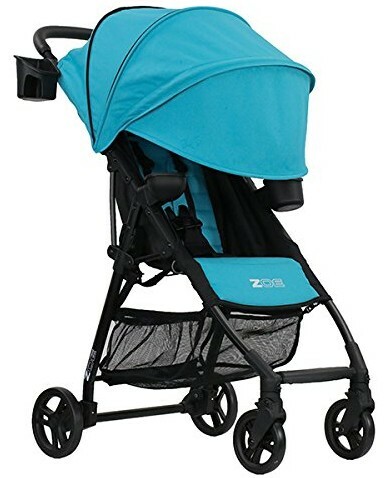 ZOE has super larger canopy that provides excellent shade, reclining seat, it has also bigger wheels than Pockit and comes with 2 cup holders and snack cup. On the other hand Pockit is super tiny when folded (ZOE is also quite compact but Pockit is really TINY) and it’s 1.5 lighter. So which one is better? It really depends on what you prefer: more features or smaller fold and weight. I would probably go for ZOE especially that you can find it even under $150 with all these accessories and convenience features. ZOE XL1 – 12.5″ wide and 18″ long backrest + 8 inches above it (child’s head is above the backrest, but there is plenty of head room under the canopy). How much your baby weighs and how tall is he/she right now? B-Agile, B-Livery, GB Pockit +, Maclaren strollers and G-LUXE have capacity of 55 lbs/25 kg, so they are only slightly above the limit you’d like to have. Only City Mini GT has capacity of 65 lbs. Keep that in mind. If you’re okay with the capacity, B-Agile may be a good choice, but the canopy is not retractable. Beside this, it has the features you’ve mentioned: the seat reclines and is quite roomy, the basket is sufficient to fit few shopping bags, you can steer it with one hand (on flat terrain) and you can easily close it with one hand. The canopy is breathable which will be useful in a hot climate. B-Agile is great for child up to 40 inches. GB Pockit+ can hold an old and tall (some parent use it even for 6 and 7 year old kids) but rather a skinny child. So it depends on how much your baby weighs right now. The US version of the GB Pockit+ is up to 55 lbs/25 kg. But the seat is not super wide. There are also few other features that may not meet your needs: the canopy is really small, the basket is tiny – I wouldn’t recommend it for shopping. And you can’t close it with one hand for sure. One hand steering is also quite difficult, maybe on completely smooth ground. City Mini GT (2016, not 2014) is awesome and basically checks all boxes (very roomy seat, perfect for tall child, large canopy, one-hand steering, easy pushing, one-hand fold), but it does weigh 22.5 lbs. Among Maclaren strollers only Techno XLR offers one-hand steering because it’s the only stroller that has one-piece handlebar. Folding with one hand is also possible. The canopy is decent. G-Luxe doesn’t offer one-hand steering and requires two hand for folding, but it does stand on its own. The canopy is big, seat is spacious, basket is not very big, but can hold a bit of shopping. Nevertheless, among these six strollers I would consider two. If you’re okay with the capacity of the B-Agile (55 lbs/ 40 inches) – it’s a good choice, it’s lightweight to operate. If you need stroller for even taller and heavier child then I think the City Mini GT is the best among these six strollers and closest to meet all your expectations, except for its weight. PS. Frankly, I think it’s quite difficult to find a stroller that would meet all your needs – it’s hard to find stroller that is lightweight, yet able to hold a heavy and tall kid, and that steers and closes with one hand 🙂 Therefore you would probably need to skip some of the features..
It’s not that she weighs a lot now, but more of me wanting to be able to use the stroller for a couple of years. Haha… She’s currently 2 years 5 months old. Height stands at 99cm and weighs 14.9kg; so she’s a bit of a beanpole (for now… judging by the family genes, probably not for long LOL). Hi Tanya! I can recommend you the Keenz 7S Wagon – it’s 25 inches wide so it fits through standard doorways. But it’s long (like tandem strollers) so it takes practice to get used to it and learn how to maneuver it. It may be quite hard to maneuver it through tight alleys in stores or tight corners, but it’s the same issue with tandem strollers. And with side-by-side double stroller it’s even worse because they are often too wide for that. It has removable canopy, but it doesn’t block the air flow. You can also add side curtains, when kids want to nap or to protect them from wind etc. And it’s suitable for snow too. 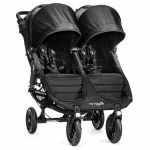 Among strollers I can recommend you BOB Revolution Flex and Baby Jogger City Mini GT Double – but both of them are side-by-side. The former one is 30.5″ wide, the latter one is 29.75″ wide. Although they should fit through most doorways and elevators, they may be too wide for some stores. If the width is an important aspect for you, skip them. Another option is Baby Jogger City Select with sibling seat – it’s narrow like a standard single stroller (about 25″), but it’s a tandem, so it’s longer (similar to the wagon). The wheels are also okay for snow (I mean snowy sidewalks or paths, not a very deep and loose snow). Oh, and each of these strollers has good canopies, long enough to keep the sun out of babies’ eyes. My granddaughter is 3yrs old, she is 50lbs and the size of your average 6yr old. We are struggling with carseats that still have 5 point harness as well as a stroller for her. We have a joovy. Her feet drag the ground. Hi Julie! What model of Joovy do you have? For a tall kid GB Pockit (both original and Plus model) and UPPAbaby G-Luxe are great choices, each has long backrest and lots of head room. Car seats: we used the graco nautilus for our son who has always been tall and sturdy. Graco forever all in one is similar. They both extend the tallest of all the convertibles even more then Diono and Britax. Remember that the 5 point harness maxes out at certain weights on all car seats (check your manual). I think it was around 50 lbs that they should switch to the booster with seatbelt forward facing. I wish I’d stayed away from Britax as the waist portion seatbelt clips on the stroller are already getting snug on our 2 year old! I’ve heard great things about BOB strollers for big and tall kids. Hi! Love your reviews, but haven’t found what I need yet. I have a 3 year old that weighs 25 lbs (petite) & a 5 year old who weighs 50lbs. I think I want a single stroller for mainly my 3 year old…but either a skateboard or add-on extra seat, or sit & stand style for the 5 year old (who will want to hitch a ride when we do Disneyland or Zoo trips). What would you recommend? I had a single Bob and LOVED it (but lost it…and I don’t think they make attachments for 5 year olds for it…do they?) Thanks in advance! Hello Jessica, sorry for late reply. There are no additional attachments for BOB strollers unfortunately. You should consider Baby Jogger City Select LUX with an additional bench seat that can hold up to 65 lbs for your 5 year old. They have also standing board in their offer, but it’s only up to 45 lbs… most standing boards made by stroller brands are up to 45 or 50 lbs, maybe consider purchasing an universal board with higher capacity? I am in need of a stroller that can recline for a child 34″ tall and weighs 26 pounds. Any suggestions? Hi Karen! Baby Jogger City Mini GT offers really deep recline and the seat is very roomy, with long backrest so it will serve you even for few years. Some parents use it even for 4 or 5 year old kids. This stroller is good choice if there are cracked sidewalks in your neighborhood or if you like long distance strolls in parks, on grass and other more “challenging” terrains. The wheels and suspension are really good. You can check this stroller here. If you need something more compact, for example for travel you may want to consider ZOE XL1 Best (but only the version 2) which weighs only 11 lbs and folds up very compact. The seat reclines up to 165 degrees and there is large canopy that covers the baby even when the seat is in lowest position. Perfect for summer. But this stroller is mainly for flat surfaces. It has small wheels so it wobbles more on uneven ground. Have you ever looked at these for bigger kids? Particularly interested if the traditional seat can accommodate 4-5 year olds. The Sit/Stand looks versatile enough. Hi! Sorry for late reply. Let’s start with the Joovy Caboose – it’s nice, lightweight option for bigger kids and it works perfect on city terrains, grass and hard-packed gravel (but don’t take it over sand or loose gravel). You can use it with one normal seat + bench seat or add second normal seat (it’s sold separately). Both your kids should fit in it but keep in mind the weight limit for each seat is 45 lbs, moreover the height limit is about 40” for the front seat and 44” for the rear seat. Another thing is that when you recline the front seat, the child in the rear seat will have less room. Therefore this stroller probably won’t serve you very long and your children are probably close to height and weight limit. However I’ve read that some parents use it occasionally for 4 and 5 year olds, e.g. in Disneyland. Baby Trend Sit N Stand is a bit different – it has one normal seat, bench seat and a standing platform. You cannot add second normal seat, so one of your children would have to ride on a bench seat (no back support) or stand on the platform. The weight limit is slightly higher (50 lbs per seat), but the height limit is 40”. From what I’ve read parents usually use this stroller up to 4 years, so I’m not sure if there’s enough room for older kids. One more thing: Even if both strollers fit 4 or 5 year olds, they will have their heads above the seat back. You can also remove the canopy from the seat (on both strollers) if needed. 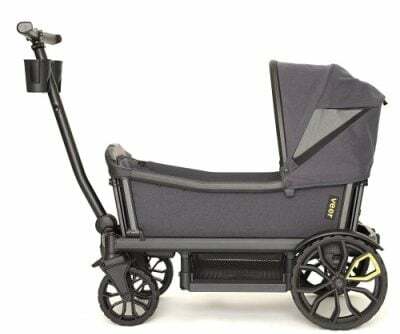 If you’re looking for a stroller for two older kids, you may want to consider wagon as well. It is more heavy, but it would serve you much longer (some models may even fit 11 year old!). You just did weeks of research for me. I have a special needs boy, 3 years old, and in need of a smaller stroller. Hi Norma, I’m very happy to hear that my ranking was helpful for you. 🙂 If you have any questions, don’t hesitate to write to me, take care! Hi I am looking for a stroller to take my 4 year old to Disney. I need something with a tight fold for the tram but that can be used when he is bigger as well. GB Pockit and GB Pockit+ offer the smallest fold in the World and can accommodate even a 4y.o. child. However folding mechanism isn’t the easiest one, but it something you get used to. 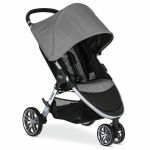 Another great lightweight stroller with compact fold in UPPAbaby MINU which folds up with one hand into a compact package. It has quite roomy seat (with about 25 inches from the seat bottom to the top of the canopy). Another stroller that will fit your 4y.o. 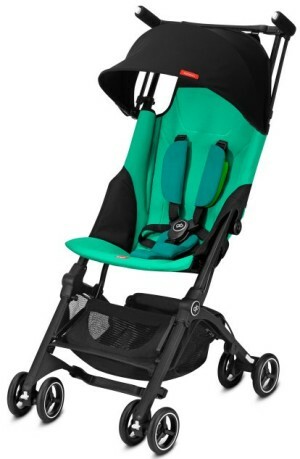 kid is UPPAbaby G-LUXE which has 27 inches from the seat to the top of the canopy. However it doesn’t fold up into a package, but has umbrella type fold (compact, but very long). MINU and G-LUXE are a bit heavier than Pockit and Pockit+, but they also feel more stable and sturdy and have more strong wheels.